I am sure this can be heard in many places where gardeners discover 'the one that got away'! You know what I am talking about. Yes, it's the zucchini. Just when you thought you had the plants all under control and there was no rogue zucchini growing unbeknownst to you. Up pops the monster. Suddenly it's there. Out of nowhere. So, it was only a matter of time that it finally happened to me. This is a Maltese zucchini which you pick when it is a manageable size (ie, when it is SMALL and does not feed a family of 4-6!). It weighed 1.5kg. 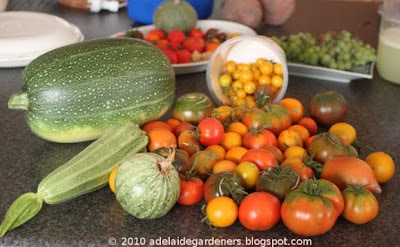 The zucchinis in front are Romanesco and Ronde de Nice (the little round one). That's okay, though. This particular variety is not seedy when that big (a bugger when you try to save seeds, though!) and still very tasty and tender. 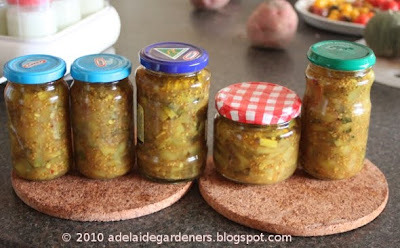 I had been meaning to make another batch of zucchini chutney, so I was happy. I used an eggplant chutney recipe from Charmaine Solomon, which I adapted slightly. I'd love to put up the recipe, but there might be copyright issues. Sorry. Those zucchini and eggplant chutneys from the same recipe sound like a good idea. If you take that big zucchini and put it in a cardboard box in a dry shed, it will dry out and be disgusting (or both). Next Spring, just bury the whole mess, and all sorts of zucchini seedlings will result, ready for planting. Somehow, I think the flesh of the fruit is designed to support the seed and help it get started next year, rather than removing and drying the seed as per normal. I've got about two dozen zucchinis from one old fruit this way, with minimal effort. Andrew, that's a novel approach of seed saving and storing! Leaving it in a shed is a good idea, as they can develop a pretty nasty smell!